The City of Canada Bay is embarking on building a City-wide plan for our canine companions. The first step is to trial new off-leash dog areas in areas where there are no existing or under-represented off-leash dog areas. Community engagement on the trials and provision of off-leash dog areas was undertaken from 24 October to 20 November. Thank you to all the community members who participated. Storey Park (beside RSL Bowling Club) - McKinnon Avenue (off Lyons Road), Five Dock. Currently there are approximately 15,000 dogs within the city of Canada Bay, representing 41% of all households (The national average is 38%). Why has council selected these for parks for off-leash dog trials? The trials are in areas where there are no existing or under-represented off-leash dog areas and the community have requested additional off-leash dog areas. Rhodes currently includes two restricted off-leash dog areas at McIlwaine Park and Mill Park, how there is a community need for more and unrestricted areas. Residential dwellings in Rhodes predominately do not have access to a backyard: 94.6% of dwellings are apartments with another 1.7% townhouses/semi-detached, so good access to community open space for both people and their dogs is essential. Over the five years to June 2018, Rhodes recorded the second highest number new dog s micro-chipped (939) within the City of Canada Bay. There are no existing off-leash dog areas on the Cabarita, Breakfast Point and Mortlake peninsula. Over 58% of dwellings in Cabarita are either apartments or townhouses with limited access to private outdoor space large enough to exercise a dog. Over the five years to June 2018, this peninsula recorded 473 new dogs micro-chipped. 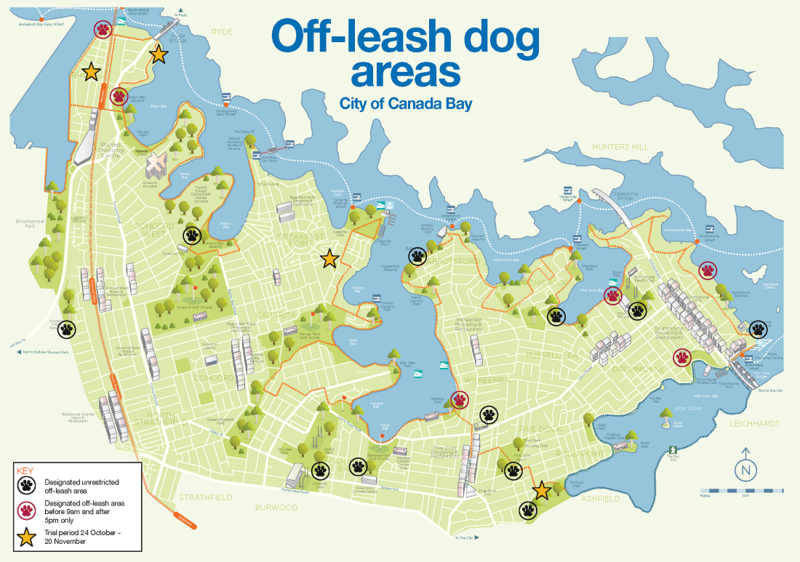 There are five existing off-leash dog areas located in Five Dock: Charles Heath Reserve; Halliday Park; Five Dock Park; Storey Park; and, Timbrell Park (west of the playground). Community members have informed Council that using the eastern side (sport fields) of the park would be more preferable for dog exercise as it is larger and more protected from Henley Marine Drive. Over the five years to June 2018, Five Dock recorded 758 new dogs micro-chipped. Are there any challenges with these off-leash dog trial areas? What provisions will be provided during the trial? Doggy waste bins and bags. If any of these parks are to proceed with off-leash dog areas, what provisions will be provided permanently? Council would investigate including permanent infrastructure such as water fountains, bins and possibly fencing in the 2019/2020 capital works program. What is the most popular dog breed in the City of Canada Bay? What is the most popular dog gender in the City of Canada Bay? What are the most popular dog breeds in Rhodes? What are the most popular dog breeds in Cabarita/Breakfast Point? What are the most popular dog breeds in Five Dock?